White Cobra Productions have also taken an approach of multiple actors in the roles, with four in total for each role across its run. The performance I saw, had Paul Fowler take on the role of Alan Ladd, while Lynne O'Sullivan was Melissa Gardner. Both are great in their roles, sparking off, but never directly speaking to each other as they read their letters to one another. It genuinely sounds as if it could be quite a dull play on paper, and it does take a little getting use to the format in the first few minutes, as cascades of words are thrown at you. However, slowly you begin to drift into the lives of these two people. A burgeoning love/hate/love relationship is revealed through letters, cards and Melisa's drawings. It all gradually becomes quite uplifting and Gurney's words have a very realistic feeling. 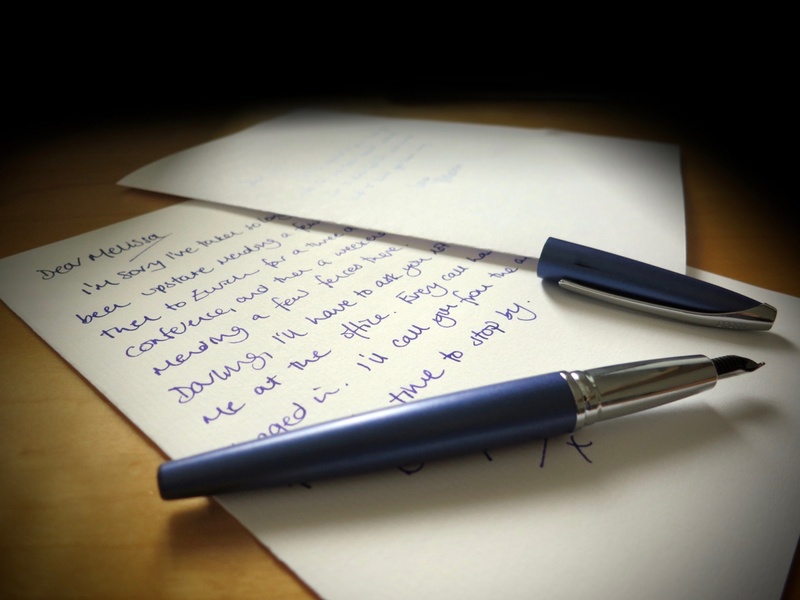 Much of the joy of Love Letters is watching the silent person, both Paul and Lynne put great effort into expressing their opinion of the letters as they hear them, most particularly when they are less enthusiastic about the content. The reading of Alan Ladd's "Christmas message" especially is a highlight, as Lynne grimaces and survives her way through this clinical letter. Direction from Paul Fowler himself, and the set are kept simple and unobtrusive as this is very much a play of words, which barring the facial reactions, would work just as well on radio. It is clear that the letters themselves have been lovingly realised for the production by Denise Swann (who also stage manages). I suspect that the eventual ending comes as no surprise, but when it does arrive, it really does provide genuine emotion. This play of lifelong love, with moments of playful banter (Mellisa happily calls Alan, Andrew Makepeace Ladd the turd at one point), stirs pretty much every emotions during it's couple of hours, and Gurney's language really does bring some beautiful words to the ear. A great production of what is actually a gorgeous, but very different play.